RealChoice: Fact-Checking the Fact-Checkers. Can You Really Do an Abortion Up To Birth in America? Fact-Checking the Fact-Checkers. Can You Really Do an Abortion Up To Birth in America? Is Donald Trump right? Can you really perform an abortion in ths United Sates right up until the point of birth? Unlike the "fact checkers" which just go to their respecitive lobbying groups and reiterate talking points, I'll actually, you know, fact check. [M]edical judgment may be exercised in the light of all factors - physical, emotional, psychological, familial, and the woman's age - relevant to the wellbeing of the patient. All these factors may relate to health. I must point out at this point that prior to Roe and Doe, there was no such thing as a third trimester abortion. Abortion was, by definition, killing the fetus prior to viability. So post-viability abortions were not only invented but enshrined as a supposed Constitutional right. And unless you define "health" so broadly as to include family concerns (which no doubt would include financial considerations), the whole idea of a post-viability "health" abortion is nonsensical on its face. If a pregnancy is endangering the mother's life or health, the standard of care has been to induce labor or perform a c-section, based on the woman's particular needs. With a c-section, the baby can be out of the womb and in the NICU within the hour, the pregnancy is over, and the mother can be cared for by medical professionals. It's nonsensical to say that it would preserve her "health" or her life to take additional steps to ensure that the fetus emerges dead. The only logical reason to perform a post-viability abortion -- to stop during delivery to kill the baby -- is to achieve the death of the fetus, either for social reasons or because the baby has a disability of some sort. Again, a "health" justification for a post-viability abortion is nonsensical, but because of Roe and Doe, the states must include them in order to pass Constitutional muster. Occasionally you'll see an old pre-Roe law still on the books that 's not enjoined, either because there are no abortionists in that state who want to perform late abortions, or because the law isn't being enforced so there's no point in going to court over it. 2. As the summary notes, after the Webster decidion in 1989 and the Planned Parenthood vs. Casey decision in 1992, the Supreme Court allowed states to put some regulations (such as waiting periods or informed consent) into place, and allowed the states to be a bit firmer about exactly what constituted "health". Still, no state can actually ban third trimester abortions, because if this "health" requirement in Doe. 3. So now we have a hodge-podge. The Alan Guttmacher Insitute (AGI), an abortion-rights research and lobbying group, summarizes state policies on abortion late in pregnancy. 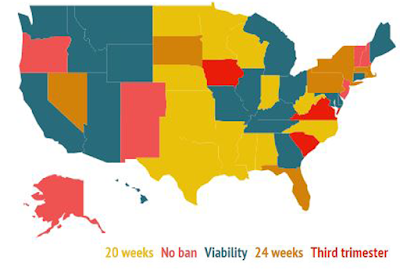 Another abortion-rights source, The Diane Rehm Show, created a map based on the AGI summary breaking the laws down into when different states restrict late abortions, but doesn't include exceptiions. 13 states ban abortion after 20 weeks without an adequate health exception: AL, AZ*, AR, GA, ID, IN, KS, LA, MS, NE, ND, OK, TX.1 state has an unconstitutional and unenforceable ban on abortion after 12 weeks without an adequate health exception: AR. Sample post-viability abortion restrictions from 2010, back when NARAL actually provided them, were as follows (verbatim from NARAL). Notice that if the state just has a "health" exception to their "restriction", then it is the Doe definition of health, which could be anything the woman or doctor wants it to be. Kansas: 'Kansas' post-viability abortion restriction states that no abortion may be provided after viability unless the attending physician and another financially and legally independent physician determine that an abortion is necessary to preserve the woman's life or continuation of the pregnancy would cause a "substantial and irreversible impairment of a major bodily function" of the woman. Kan. Stat. Ann. § 65-6703(a) (Enacted 1992; Last Amended 1998). The Kansas attorney general has interpreted this exception to include mental health. Op. Kan. Att'y. Gen. 2000-020. New Hampshire: NARAL notes no restrictions on post-viability abortion. Wisconsin: No abortion may be provided after viability unless necessary to preserve the woman's life or health. The physician must use the available method most likely to preserve the life and health of the fetus unless it would increase the risk to the woman. Others draw the line at some gestational age, but allowing excpetions for life and physical health (defined more or less broadly on a state-by-state basis), or for life and physical or mental health (defined more or less broadly on a state-by-state basis). So in eight states, a woman can legally decide at any point in pregnancy, up until birth, that she wants an abortion, and any doctor who chooses to perform it may, legally. In three states her life must be in danger in order to perform a late abortion, and in the remaining 39 states there must be a documented physical or mental health issue before the abortion may proceed. Thus, Trump was right, but left out a lot of detail.